Meet the Nomads - Cherie and Chris of Technomadia - Location Independent RVers in the U.S.A.
I’m pleased to introduce you today to Chris Dunphy and Cherie Ve Ard of Technomadia. 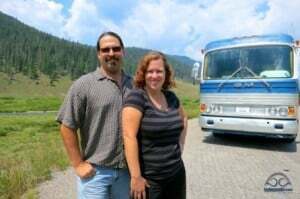 Cherie and Chris have been traveling the United States by RV while maintaining their income via solar power. Their adventures have included hosting Camp Nomadia at Burning Man. What brought you to the decision to become nomadic and how long have you been living this lifestyle? Cherie: We started upon our nomadic paths separately, so the story is different for each of us. Chris: My first encounter with modern nomadism (and the word technomad) was when I arranged for Steve Roberts to come speak at Washington University while I was in college in the mid-90’s. Steve had been pioneering combining travel and technology on an incredibly geeked-out recumbent bicycle, and he became both a friend and an inspiration. Fast forward a decade, and I was ready to leave traditional Silicon Valley work behind. I evicted myself from my San Francisco apartment in April 2006, and set off to explore living on the road in a solar powered 16′ clamshell trailer. Cherie: I had been running the family software development business out of my home in Florida, but I had structured my work to be fully location independent so that I could integrate travel into my life. This allowed me to spend extended time working on the road – whether visiting clients, or friends on the opposite coast. I had first encountered Chris online (in a Prius forum! ), and discovered that we had friends in common in California. During one of my trips west we arranged a rendezvous to meet in person, and over the course of our extended first date I got a taste of life in his trailer and for running my company remotely via solar power. Chris: Cherie returned to Florida, but it was quickly obvious to both of us that our life paths could be merged. We did an extended trial run in the summer of 2007 together in my original clamshell trailer and discovered just how compatible we were in such a small space. We then spent some time designing our next mobile home, in in the summer of 2008 we moved into a larger custom built Oliver Travel Trailer. We have been on the road living together in our Oliver ever since. A lot of people now choose to nomad to foreign countries but you have chosen to roam your own country by car and camper. Can you tell us how you made this choice and what you think the pros and cons have been? Cherie:There does seem to be a lot of emphasis on nomadism equaling traveling the world, and it sometimes feels as if “global nomadism” is the holy grail of being a ‘real’ nomad. And while we both have lots of international travel experience and intend to do much more in the future, we’re currently choosing to stay domestic. Chris:We’re not attempting to travel before settling down somewhere, but instead we are creating a lifestyle of full time travel that could be unending. International travel is fabulous, but there are extra challenges that can decrease the sustainability of it. Domestic full time travel has given us the freedom of mobility, while keeping us accessible to family, friends, work, and easy and affordable wireless bandwidth. Cherie:We both are blessed with awesome families and communities of friends, and we wanted to be able to incorporate more quality time with them. Our form of nomadism has allowed us to have extended visits that aren’t compressed into ‘vacation mode’ with friends and family across the country, as well as rendezvousing with loved ones when they travel for business or pleasure. As a result, we’ve not experienced some of the isolation from community and deep relationships that we’ve heard from many full time global nomads. Chris:And as we’re not independently wealthy, we do have to incorporate working into our lifestyle. Traveling internationally introduces a lot of challenges that would make it hard to keep up with our current clients – such as time zone differences, work visa considerations, and maintaining regular communications. Cherie:We do however intend to scratch our global travel itch in the future, but for now traveling domestically is keeping us quite abundant in experience and variety. That’s the great thing about being the playwrite and director of your life story, you can adjust the script when you want to change the plot line. Have you ever driven out of the U.S. into Mexico or Canada? Cherie: Not yet. We keep intending to, however we keep finding too many inspiring and awesome things within our own borders that keeps us distracted. It’s amazing how much amazing stuff there is if you take the time to explore it. Chris: Spending an extended time in Baja is definitely something I would like to do, and also the road trip north to Alaska. But were in no rush – we will get to all of these places soon enough. Are your travels at all weather dependent? I mean, do you try to avoid winter weather or does it matter? Cherie: We keep seasonal weather patterns in mind, but we don’t let them completely drive our adventures. We’ve been known to roast in the desert (without air conditioning) in summer temps of 110, and to head to snow prone areas in the winter. Our travels are much more based on people we want to see, events we want to attend and work opportunities. We’ve designed our home on wheels to be rugged and able to endure a variety of weather conditions so that we don’t have to keep weather as a primary consideration. Being adaptable helps a lot too. Chris: We’ve just spent over a month in Kansas and Missouri in the middle of winter for work and family opportunities, but in another week we will be heading down to Florida to spend the rest of the winter out of the cold. It is really nice to have that sort of geographic flexibility! Of the other campers you meet along the way what percentage would you guess are roaming full time like you? Is there a community that forms among full time campers? Cherie: A lot of folks are surprised to hear that there are over a million full time nomads exploring the US. Most of them are retired RVers however. They’ve paved the way to making the logistics easier for all of us, such as how to handle mail, voting and vehicle registration when you don’t have a physical fixed address. Chris: There are many communities that form – from a groups of full-timers caravaning together from campground to campground, private campground membership groups, and communities that keep in touch online and rendezvous at rallies and events. A lot of the communities tend to be centered around a special interest – such as volunteer work, spiritual leanings, RV brand/type, ‘workamping’ or simply formed friendships. Cherie: The community of full-timers that we’re most aligned with is NuRVers.com, which is a group of other younger non-retired full time RVers, most of us who are also location independent digital nomads working as we travel. It’s a wonderful community of like minds and we enjoy rendezvousing with folks we’ve met there during our travels. Plans are coming together for a gathering in the first part of next year. How do you support yourselves on the road? What has been your average cost per year or month to live this way? Cherie: I continue to run the family software development business (my father works for me!) that I was involved with before I met Chris, but Chris and I also started our own technology consulting business. Together we do various market research and strategy development projects, primarily focused in the mobile technology industry. The projects we tend to take on are short term and intense. We prefer to work in bursts instead of keeping ‘regular business hours.’ We don’t really have an average cost per month, as our months can vary so much depending on what we’re doing – but we do keep a log of our expenses at technomadia.com/the-finances-how-to-afford-it . Chris: We also occasionally take on other short term gigs just for the heck of it. For example, we joined several hundred other “workampers” hired to help out with the holiday rush working at Amazon’s largest distribution center. It was a lot of work, but a very worthwhile and rewarding experience to literally have our fingers on the pulse of the American economy. We also devoted a month last year to volunteer full-time on the Obama campaign, running a field office in rural Nevada. Has your equipment turned out to be reliable? What about connecting to the internet? Is there any equipment advice you would give for people choosing to live a nomadic lifestyle in a camper? Cherie: Our tech gear suffers a bit more wear-and-tear than if it were based in a stationary home, but probably a lot less than it would if we were living out of a suitcase or a backpack. Chris: Currently, our primary connection to the Internet is via a Sprint Aircard and a mobile router which creates a WiFi hotspot in our trailer wherever we can get a Sprint signal. We also both have iPhones (AT&T), and can connect to the Internet through them as well. To help with getting a signal in fringe areas, we had a cell phone booster system built right into our trailer. Cherie: Some other people go with satellite internet connections, but those have a lot of downsides to be aware of. Other people make due with tracking down free public WiFi hotspots. Can you tell us a bit about Camp Nomadia at Burning Man and what that was all about? Chris: I’ve been going to Burning Man since 1999, and the temporary metropolis of Black Rock City that emerges from the desert for one week each year has become my favorite city on earth. There is so much artistic and creative energy on display that it really is beyond words to describe. Cherie: My first experience with Burning Man was during our first summer on the road together, in 2007. When you arrive it’s common to be greeted with ‘Welcome Home.’ While it sounds cliche’ at first, for many it’s an emotional connection that you just can’t grasp until you experience it. Chris: This is especially significant for nomads – we really WERE at home during Burning Man. So, we set about gathering other nomads together to create a neighborhood of folks who were like us – really at home. Our first Camp Nomadia was in 2008, and it was fabulous. We repeated it in 2009, and it was off the charts successful – we had 70 nomadic minded folks in the camp, many of them full time travelers. We’ve had nomads who travel by RV, backpack, sailboat, hitchhiking and running join us. Cherie: We will be hosting Camp Nomadia again in 2010, and we invite any and all nomadic minded folks to join us! Chris: If you have no fixed home base, you have the luxury of being able to pick a state to be “from”… We picked South Dakota – a state that is particularly supportive of full-time RV’ers, and which has no state income tax. Other popular states to establish residency in include Texas and Florida. Cherie: It’s amazing how much variation there is within one country – taking the time to stop and experience it is enlightening. We have absolutely loved exploring the US at a slower and more relaxed pace. You see and experience so much more when you are not rushing from one tourist hotspot to the next. Thanks so much to Chris and Cherie for all the information you’ve shared with us here. I encourage everyone to learn more about their journey at Technomadia! Great interview! I love following Technomadia on their journey – I've wondered how FT RVers deal with taxes…is it an issue to not have a permanent address in paying taxes? How do you address this? I'm curious, because I envision my life on the road at some point and would like to know how these big issues play out. What many people do in this situation is similar to what Cherie did. South Dakota is one of the easiets states to establish a residence and have your mail fowarded (see http://www.alternativeresources.net as an example) . Since SD does not have a state tax it removes the need to file at home, however, any work in a stae with an income tax will require a filing. If you are simply usiong the SD address (or any address for that matter) as a mail portal, it is not a "tax home" from which you can claim travel deductions. From a tax perspective, you want to be careful not to overstay your welcome in a state or otherwise, they can demand taxes on all your income. Good info, Joe. Hey, can you recommend a foreign bank to place some of my deposits in? A foreign bank? What is the purpose? Investment (currency swings, interest) or something else? Yes, indeed. We're very careful to know how long we can stay in certain states and what sorts of things might flag us as residents for local tax purposes. We'll be addressing this topic in an upcoming post with many of the resources and gotcha's we've encountered. PS – that is such a great picture – you look so happy! Is that in Utah…? Yes.. that picture is from Utah, Bryce Canyon to be exact. We actually do have a domicile address in South Dakota that we use for voting, paying federal taxes, driver's license, vehicle registration, etc. It's a mail forwarding service dedicated to full time RVers to handle those sort of logistics. There are several states that are considered good choices to have as your registered address – generally those without state income tax. But you also need to look at residency requirements, jury duty obligations, vehicle inspections, insurance rating and other tax concerns in making the ideal choice for you. The issue of paying taxes (something I know more about today since I filed them just this morning) was covered in one of our blogs here and on the parent website (http://www.nunomad.com). There's an expert in the field of nomad/travel taxes and you might want to nudge him should you have any questions. Joe Smith (I kid you not!) of http://www.traveltax.com is the guy. Wish you well on your preparations. Great interview Carmen! And spectacular photo of you guys, I love Bryce National Park! Thanks Cody! It’s great to have you reading the blog. What an awesome story. Cherie and Chris are our role models. We are not sure when our FT RVing will happen for us ,but we know it will happen. So we try to follow Technomadia's journey closely. They were one of our few first friends on Twitter as well. Wondering how you handle health insurance, medical, dental appointments and check-ups?? I imagine that if you're traveling by RV in your own country it wouldn't be too hard to swing by your home city for yearly check ups. For health insurance we have individual high deductible HSAs with a PPO provider network that is fairly nationwide. This gives us access to medical care without geographic penalty when we need it. For minor stuff, our plan offers a telephone/internet doc option to get prescriptions filled for sinus infections, etc. – which makes it quite travel friendly. Our plan is through Assurant. I do still keep my doctors from when I lived in Florida, and try to arrange my preventative needs through them for now. My primary doc is quite internet saavy and a nomadic spirit himself.. so he’s been awesome. However, as we’ve traveled we’ve established a few ‘home bases’ where we frequent because of people who live there – so we put some effort into establishing medical providers throughout the country. We're honored that you guys have been inspired by us.. as many are inspired by your story too! As far as health insurance – we finally settled on a high deductible HSA with access to a nationwide network of providers. The bonus is that it has a telephone/internet doc component for prescription writing for common infections – which makes it quite nomad compatible. For appointments, I do tend to arrange my check-ups when I'm back in Florida with the providers I have a long standing relationship with. But we're also putting conscious effort into establishing medical records at providers in locations we find ourselves returning to often. We'll be addressing this exact topic in an upcoming post that I'm still working on. Sweet interview, really interesting that you guys have been technomading for so long. Well done! It would be challenging for me to live where I travel, I'm a home base kinda guy…especially when I'm working on projects like now but I guess if you bring your home base with you everywhere that could work! True – you'd have the comforts of home and the sights of the world all at the same time! Yes.. traveling with your home is a great way to balance it all .. it’s worked really well for us. It think it’s what has kept it sustainable for us long term. And in our travels, we’ve been able to establish home bases with friends & family who have an open welcome for us to come be temporary neighbors. So in those cities we try to develop a sense of community, cadre of doctors and service providers, etc. Thanks Robert. We've definitely found a great confluence of having a feeling of a homebase while exploring our wanderlust. Folks are usually surprised to learn that we can be quite the homebodies at times. What a lovely interview, Carmen, about some great digital nomads! We're a world traveling family that has been touring the globe primarily by small, green RV since 2006, so always love hearing more about Chris & Cherie's RV style. Fun photo. Nomadia sounds cool! We've had absolutely no problem handling taxes, insurance, dentists or doctors on the road (at MUCH cheaper prices no less) or even school, so I'm sure it's even easier with so many RVers in the US. It's quite easy to gather information from RV organizations online in both the US & Europe for those interested in full-timing. We particularly like FOTR (families on the road) as they specialize in families doing this. Great suggestion about FOTR. Realizing how you and Cherie and Chris both nomad by RV has put the idea in my mind – do people ever do RV trades (like house swapping) so that you could see different continents? That would be a great idea.. we’ve actually wanted to find nomadic domicile trades. For instance, finding other nomadic folks who want to split time between sailing/boating and RVing. As far as RVing though, renting a RV for where you want to go can be easily procured. And sometimes, if you’re planning extended RVing, buying a used RV can be quite affordable too. We'd love this idea! We also dream about a network of nomads who would want to exchange modalities of travel – such as sail boats, biking rigs, airplane, large RV, off-grid RV, etc. For shorter term RVing, renting an RV is always an option. And for more extended (but limited time) travel, buying a used one tends to work out to be a good deal too. I enjoyed the interview – you two are looking delightfully happy, and it's good to see the adventure continuing! Thanks for the shout, also… I'm honored to have been an inspiration to you, Chris. My own wanderings, on hold for too long whilst building the Microship, are about to resume with our little flotilla (Nomadness and Dervish sailboats, and the Polaris mobile lab for R&D). Re the taxes and other related issues… I've always maintained a virtual home base, with a person who receives a percentage of cash flow to maintain the illusion of stability, handle mail and finances, archive backups, maintain a spares inventory, manage photos, deal with media inquiries, ship spin-off products like books, and so on. This person's title is "universe interface," and it's not an easy job. “Universe Interface,” I love that title! We've heard of other full time nomads using a universe interface type person to handle a lot of their logistics. It seems like a very good solution for those who need an extra hand with that sort of stuff. I think personally, I'm too much of control freak to hand it over :). We're anxiously watching the development of your technomadic flotilla, and hope to join the fun some day! I finally got to meet Cherie and Chris at Camp Nomadia at Burning Man this year and they are fantastic, supportive people. Their story is inspiring because they don't feel the need to conquer the world as RTW nomads. Rather, they're down-to-earth and just interested in enjoying each day as it comes along. I stumbled across Technomadia about a year ago. Wow! I loved reading about the US Nomad (which seems less common these days) and want to do the same. As a married college student, I am trying to talk my wife into giving up our apartment for a trailer. Unfortunately, while she's willing, we're not having any luck finding a place to park during the school year. Our breaks would take on a whole different meaning, if we could take our home with us! My recent post Some of 2010’s Goals Completed Already! Have you looked into trailer parks in your city? I know the word “trailer park” often has negative connotations but some can be really clean, pleasant and inviting. I think domestic travel could be a even more rewarding than international travel. Staying in your own camper and always having a reliable Internet connect would be huge pluses. I know other countries more than my home country of Canada. It would be great to tour across Canada and the States! Burning man would also be an awesome event someday. Thanks so much for stopping by, Sandi. How great that you got to met Chris and Cherie. I hope to cross paths with them sometime soon! Love your site..very informative! I a mprobably going t obe living in a van soon haha..serously! I see you are now in Miami.I am in Naples..if you stop here..email me! They've certainly seen more of the U.S. than I have, as I'm stuck in a cubicle! I would live to be location independent and travel while I blog or freelance in some other capacity or, even better, enjoy my nest egg. That's got to be the dream life. Fantastic interview. I like this site it’s really well got to be the dream life. I really like following along with the technomadia crew as they get around the US. It’s very inspiring to see what is possible these days, you really can live an exciting life and still pay your bills. I’m sure their stories make alot of people think about their own situation. virtually? Just curious about levels of trust you’ve had to have with them. Jumping up and down right now. This is much needed inspiration and information, as we’ve been living and working on the road (in the U.S.) for just 6 months. Loving it!!! however, some logistics are looming. We’re really worried about taxes (still residents of California) and health care (we currently have none)… those things are never top of the list. So, thanks for the links… we have much to learn/do. As for the fun stuff, we are also tech folks, using free Wifi and cellular connections (Verizon 3G, iPhones with ATT, Bookstores, Cafes, etc)… which is working for us. Currently we’re trying to figure out an “always on” power source for our router. Maybe a Solar panel and an inverter, so our 110 power is always on? We have an old CB connection that seems a likely power spot as well. Any ideas/references? Electrical stuff in our 1988 Class C (Lazy Daze) is pretty frightening. In the meantime, enjoy your travels, we’ll continue to read along and learn from the pros! Oh, and we’d love to be invited to the next Nu Rvers.com camp-gathering. office as we welcome all patients as if they were family.